So Christmas is getting closer everyday and you are trying to think of some last minute cheap gifts and decorating ideas. 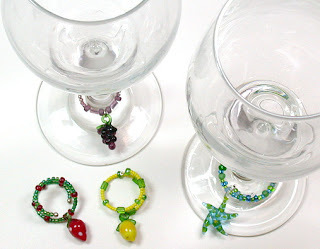 Wine glass charms are a cheap and easy craft. They are also a great homemade gift, just be sure to make some for yourself too. They will dress up any gathering and add a bit more sparkle. They will also keep those annoying guests from drinking out of your glass. 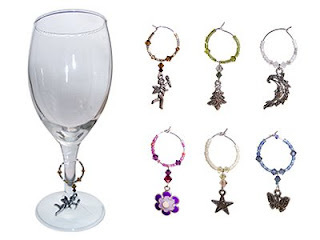 You always see so many beautiful wine glass charms so why not make them yourself. Then they are exactly what you want. You can make them in many styles and colors to fit who you are. So here are some instructions. 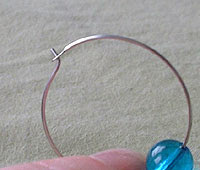 Your first option is to use ear wire beading hoops. If you choose this option you just need to buy some ear wire beading hoops and beads. Simply arrange your beads the way you want them and then use a jewelry pliers to bend up the end. The end then fits into the hole to close the wine glass charm. Your second option is to use ring sized memory wire. If you choose this option you just follow our instructions for a memory wire bracelet but you use the smaller ring size wire and make a tiny version. The wine glass charms made this way just get wrapped around the stem of the wine glass just like the bracelets are worn. Everything you need for both options can be found at craft stores. If you want to add charms make sure you also pick up some jump rings for them to hang from so the charms can dangle.